The number of hip replacement operations on people aged under 60 has risen 76% in the last decade, NHS figures for England reveal. In 2004-05 there were 10,145 hip replacements for people aged 59 and below, with 17,883 in 2014-15. 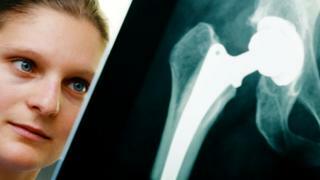 The Royal College of Surgeons says this is partly because doctors are now more confident that replacement joints will be more durable than in the past. Patients are also said to be less willing to wait. As a proportion of all hip replacements carried out, the rise among under 60s is small, but the Royal College of Surgeons says it is still noteworthy. Demand for new hips across all ages has risen - there were 89,919 of the operations in 2004-05 and 122,154 in 2014-15. Stephen Cannon, vice-president of the RCS, says as hip replacement techniques and prosthetics have improved, so have the numbers of younger patients undergoing this type of surgery. "It's no longer seen as a last resort. "As surgeons, we now have more confidence about the wear rate of these prosthetics which allows us to be less restrictive on an age basis." He said surgeons used to advise patients with hip pain to wait until they were 60 or 65 to have a replacement because the old-fashioned replacements had a shelf-life of about 15 years, meaning the operation might need redoing once in a lifetime - when the patient had turned 80. "If you look at newer prosthetics, you could do the first operation at 55 and it is going to last for 20 years or more, so you would still only need one revision in a lifetime." He said another factor might be patient demand. "Certainly, in my experience, patients do not get fobbed off. They don't want to wait for an operation. They say, 'I can't play a round of golf or tennis and I want to.'" Mr Cannon said concerns over the safety of a particular type of hip replacement (metal-on-metal) in 2010 did not appear to have affected demand. He said hip operations had become less arduous. Patients can be back on their feet with crutches on the same day or the day after surgery, and out of hospital within three days post-op. "They're off crutches altogether by six weeks." Most hip replacements are done if the joint becomes damaged from arthritis or an injury. Many of the conditions treated with a hip replacement are age-related so hip replacements are usually carried out in older adults. Mr Cannon says it's not clear if conditions such as osteoarthritis are becoming more common and affecting people at younger ages, but it is worth exploring. And with an ageing population, he says demand for hip operations could soon outstrip supply. "The ageing population is a perfect storm. We are not there quite yet, but we might be in 10 years from now. It's a continuing trend." A spokesman for the National Joint Registry for England, Wales, Northern Ireland and the Isle of Man said: "The increase in numbers of under-60s undergoing primary hip surgery is entirely in line with the overall increase in provision of the operation. "The orthopaedic sector must continue to work to get the first time surgery as right for the patient as possible - especially where younger patients are concerned as they are most likely to need at least one revision surgery in their lifetime. "It is, of course, heartening and very encouraging that hip and knee implants are lasting ten years or more, with risk of revision lower than 5%. "Joint replacement surgery offers significant benefits - getting patients back to their chosen lifestyle sooner, free from pain and with improved mobility."